“I saw that inside, somewhere inside, there is an amazing animal just waiting to be loved." When Rambo got sick, he lost the only home he’d ever known. 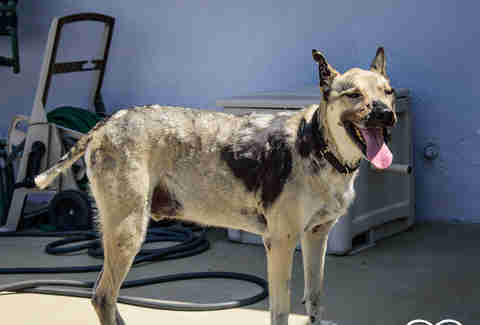 The senior dog had started to lose patches of fur, revealing red, scaly skin underneath. 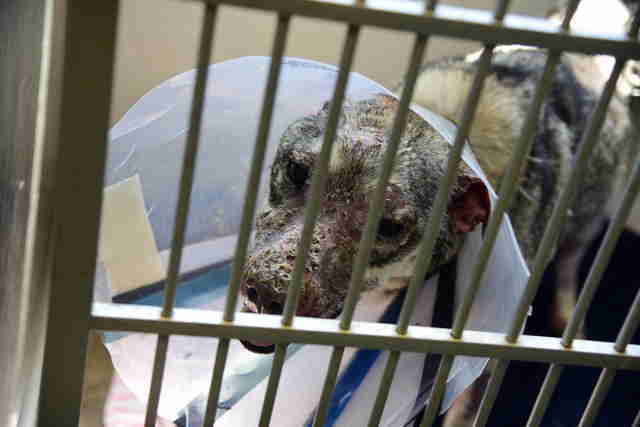 It quickly became too painful for him to walk, or to even move his inflamed ears. 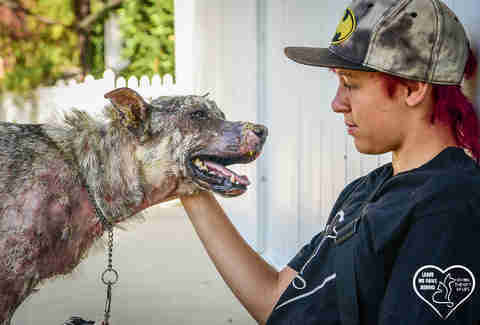 Unsure of how to treat the mysterious condition, Rambo’s owner brought him back to the same shelter where he had adopted him nine years earlier and left him there. 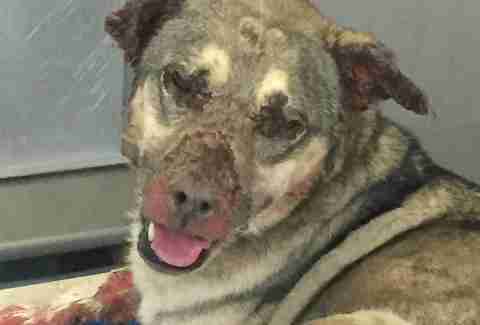 Soon he was scheduled to be euthanized. But Rambo didn’t know he had someone in his corner. Toby Wisneski, founder of Leave No Paws Behind, a rescue that specializes in senior dogs with medical needs, came across a Facebook message appealing for help, with Rambo’s picture attached. Because Rambo was scheduled to be euthanized that afternoon, Wisneski quickly called the shelter to see if he could be spared, but saving Rambo wouldn’t be quite so simple. Rambo had become a little cranky, and staff couldn’t get near enough to examine him or administer his shots. He couldn’t leave without his vaccinations, Wisneski said. Wisneski convinced them to try one last time, and, sure enough, Rambo remained docile. 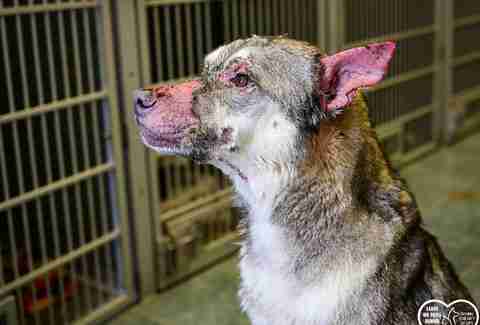 Within an hour, the sick dog went from death row to the back of a warm car on his way to freedom. 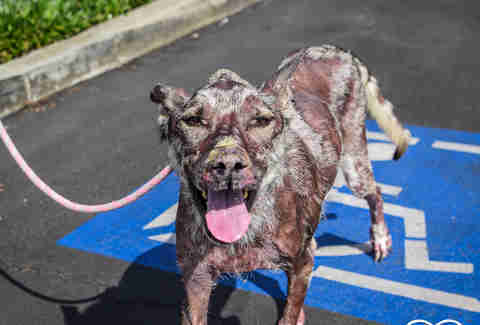 Employees at Pet Doctors of Sherman Oaks provided a diagnosis for his mysterious illness, and Rambo immediately began treatment for pemphigus foliaceus, an autoimmune skin disease which causes painful scaling, itching, ulcers and redness. While curable in theory, treatment would be extremely time-consuming and costly, the vet warned, but Wisneski knew she had to at least try. 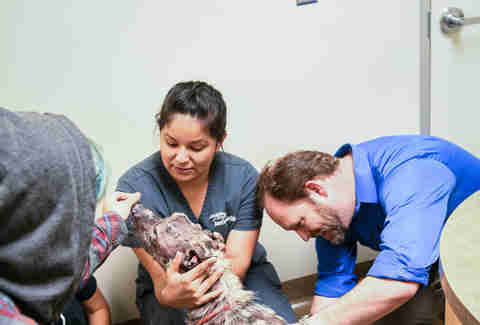 Rambo’s case was so severe that it drew the interest of John Angus of Animal Dermatology of Pasadena, who offered to see the dog free of charge. For eight months, Rambo lived at the veterinary facility and received round-the-clock medical care. The high dose of steroids he was prescribed caused all his remaining hair to fall out, and weakened his bones and muscles. But despite the pain and frailty, Rambo remained loving and gentle. Then, one day, Wisneski went to visit Rambo and he looked (almost) like a normal dog. With Rambo ready to finally return to a real home again, Wisneski searched for a foster home for him, but his medical restrictions made placement difficult. When nobody stepped up, Wisneski decided to take him in as a forever foster under Leave No Paws Behind. Since arriving at his new forever home, Rambo has been the perfect gentleman and so grateful to his rescuer. 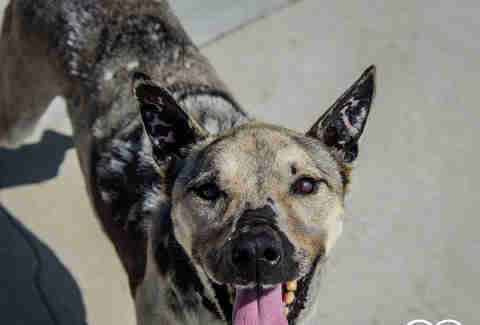 It's been nearly a year since he was pulled from the shelter, and Rambo's illness is finally in remission and his body is covered once again with a healthy fur coat — vets believe he's a purebred German shepherd. Due to his sensitive skin, he will never be able to walk in direct sunlight, but that doesn’t stop him from trying to lie in whatever sunbeam he can find when his mom’s not looking. After all the hard work, Wisneski couldn’t be happier with the new addition to her family. To help support Rambo’s continued medical care and that of senior dogs like Rambo, you can make a donation to Leave No Paws Behind.